THE ITALIAN TRADE AGENCY AND UCINA ARE SUPPORTING THE ITALIAN BUSINESSES SHOWCASING THEIR PRODUCTS IN THE USA. CARLA DEMARIA, PRESIDENT OF UCINA: “POSITIVE US MARKET TREND CONFIRMED. THE MADE IN ITALY BRAND DEMONSTRATES QUALITY, EXCELLENCE AND INNOVATION, AND IS RECOGNISED WORLDWIDE”. Sunday 4th November, marked the final day of the 59th edition of the Fort Lauderdale International Boat Show, with an overall presence of 1,200 boats on display and roughly 100,000 visitors. The Italian Trade Agency and UCINA, Italy’s Marine Industry Association, put together a delegation of companies taking part in the event in order to support and encourage the development of business and networking opportunities for Italian operators. The collective chosen to display their products included Aries (a Trieste Chamber of Commerce Special Company), Atep Italia, Api, Besenzoni, Boat Lift, Frigomar, Liguria Produce, Navaltecnosud, Opacmare, Schenker, Viraver Technology. “The Ft. Lauderdale International Boat Show – stated Carla Demaria, President of UCINA and of Monte Carlo Yachts, which showcased four vessels from the MCY line-up during the Florida event – confirmed the positive trends recorded by the American market, which continues to be extremely interesting. We also saw Brazilian visitors reinvigorated, perhaps due to the latest political course”. 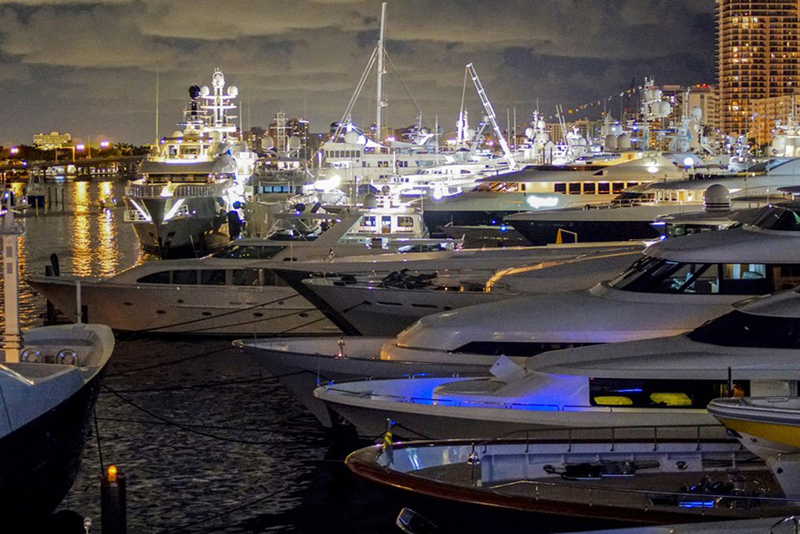 “Following the excellent results achieved by the Boat Shows in Genoa, Cannes and Monaco – continued Carla Demaria – we can safely say that both the US and European markets are back at the helm of the world of boating. It is a source of great pride to see so many Italian companies and UCINA members taking part in this boat show, confirming that the Made in Italy brand demonstrates a quality, excellence and innovation that is recognized worldwide”. Overall Italy was represented by 30 businesses from the country’s boating industry landscape, including Austin Parker, CMC Marine, Gianneschi Pumps&Blowers, Monte Carlo Yachts, Overmarine, Pardo Yachts, Rossinavi, Sanlorenzo, Yacht Controller, ZAR Formenti. The Fort Lauderdale Boat Show was also a perfect opportunity to discuss the excellent results of this year’s edition of the Genoa International Boat Show with the American press and with the companies taking part in the Florida-based Boat Show. Results that included 174,610 visitors and 951 brands on display, making the Genoa Boat Show the leading boating event across the entire Mediterranean and an essential tool for companies throughout the industry. The international initiatives organized by UCINA and the Italian Trade Agency will continue with a delegation of Italian businesses at the METSTRADE Show in Amsterdam (13th – 15th November) and with an institutional presence at BOOT Düsseldorf (19th – 27th January 2019).